Put an egg on it! Not really a recipe but delicious quick and easy breakfast. Whole grain toast, spread with avocado and an over easy egg on top with some Texas Pete. I made enough for just me. While it was good it seemed need something more but I wasn't sure what it was. Great healthier alternative to breakfast potatoes, but it did take a tad longer than expected to get the sprouts as crispy as I wanted. I had some leftover diced tomatoes with green chilies so I used that in place of the diced tomatoes and diced chilies. I just made enough for one. Delicious. I did add some Texas Pete after I took the picture and is turned out quite spicy with the green chilies too. Nice light soup and very easy. Didn't have a lot of flavor as is so I added 1.5 tsp salt, 1/4 c basil, and .5 tsp sherry vinegar. My zucchini were on the small side so I only added 3.5 c broth and the consistency was good. I've made this several times and comes out really quick and really good. A hearty Winter soup. I made three changes: I used (already cooked) white chicken and kale sausages ( instead of uncooked sausage) and used Swiss chard instead of escarole; I cooked on high one hour and low for four. The results were great! It reminded my husband and me of minestrone soup with a pop of heat with the red pepper flakes. Served with a baguette and Cotes du Rhône wine. Delicious. May add gluten free noodles/pasta to the leftovers. This was really tasty. We used the spice blend rather than taco seasoning and I would use it again. We also found it to be pretty mild, but made choices that kind of kept it that way. (We used mild green chiles and regular canned tomatoes with no chiles as we couldn't get Rotel, so threw in a whole jalapeno with seeds.) Depending on the type of chile powder you use (we used medium)- this could potentially get really spicy, so do what works for you. I cooked it 4 hours on high and the chicken was on the verge of overcooked- 6 hours would have really blasted it. This was delicious, and in our case quite spicy. Easy to toss together. I used a combination of boneless breasts and thighs. I used the Instant Pot, and messed up by not setting the slow cooker temp to high. Unsurprisingly, after six hours the chicken was still way undercooked. So, I decided to experiment with finishing it using the pressure cooker, which I did for five minutes, with a 10 minute release. Turned out perfect! Very tasty, and I’ll make it again (on the correct setting next time). This was perfect for a cold winter night's supper. I used corn instead of peas since son and I enjoy corn more than peas and hubby likes both. I used a whole 8 oz package of baby bella mushrooms instead of the 6 oz. called for. As written this was *almost* great, but it was lacking a crunchy component - I feel like a Caesar really needs that, even if it isn't in the form of a crouton. We added the Perfect Roasted Chickpeas from The Oh She Glows Cookbook and they absolutely made it. That said, we really liked this iteration of Caesar dressing - it had a lot of acid, a lot of anchovies, and not that much oil, but it all really balanced out in the end and stood up to the kale. 3.5 stars on its own, but combined with the chickpeas, at least a 4.5 - solid healthy weeknight dinner. We did not care for this at all - the mushrooms took on an odd spongy texture roasted in so little oil, and it just seemed like a somewhat random selection of ingredients overall. This was a quick meal to put together and quite tasty. Perhaps a little less soy next time and a squirt of citrus or pinch of chilli. I did an over easy egg. Since grape tomatoes are more flavorful this time of year I used those instead of a slicing tomato. This was a great quick breakfast since I had some leftover brown rice in fridge and just had to heat it up before adding the other ingredients. Delicious. I didn't spiralize the cucumbers just diced them. Good for a very easy and quick dinner. I used dried oregano. Good. We both liked. Sauce was a little thin. Next time try draining the tomatoes. Scant 1/2 tsp red pepper flakes was the right amount of heat. I overcooked this by mistake (8 hours on high instead of low) and this was still really good. This does require sautéing before using the slow cooker and I strongly recommend draining the fat from the lamb before proceeding. In addition to the mint that is added at the end, I also added more harissa and lemon juice for brightness. 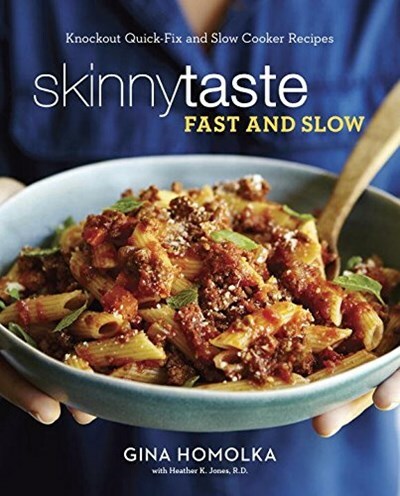 I'm a Skinnytaste fan but this recipe was too bland. I was suspicious about the one sprig of fresh oregano, but even after adding 1.5 tsps of dried oregano and 2 tsps salt it was still pretty bland. I used 7 thighs instead of eight and thought the chicken to sauce ratio was too high. I converted this for the pressure cooker, and it was delicious. I added about 8 oz uncooked egg noodles before starting the pressure cooker and halved the amount of mushrooms. I really loved these. Son said not a favorite for him but he did like. We both loved the pickled onions and I should have made a double recipe as Gina suggested since son and I kept snacking on them, and they'd be good with other foods as well. I'll definitely be making those again. Hubby was a little under the weather so he ate something lighter. Son didn't eat avocado on his since he detests avocados in any form. I used green cabbage instead of red. I also used my cast iron skillet instead of my cast iron grill pan, since the skillet is easier to clean. This was a decent recipe and I would probably make again; however, not a standout dish. This recipe would work great if you adapted to instant pot or other pressure cooker. I was at a loss as to what to make for dinner tonight. So I grabbed a few cookbooks off the shelf and started thumbing through them until I found a recipe that did not require a quick trip to the grocery store. It was delicious and quick. Only change I made was to substitutes a large shallot for the onion, and Korean chile flakes for the red pepper flakes. This was good for a quick dinner, although I would prefer ground turkey to the chicken if I make it again. It calls for gochujang to be added as a sauce, but while I usually love gochujang, in this case I didn't like it at all. Quite tasty. With the half cup of cayenne pepper sauce, the chicken is spicier than I normally like, but the celery, blue cheese dressing, and cool lettuce leaves (I used Romaine) helped offset the heat. This was easy to put together. I started the chicken in the slow cooker (on high), prepped the celery and carrots, and made the blue cheese dressing before heading off to the gym. I finished up after I returned by shredding the chicken, putting it back in the SC with the pepper sauce, and heating some corn bread in time for dinner 25 minutes later. Next time, I’ll skip the homemade dressing. It’s pretty soupy. I’ll just use Bolthouse blue cheese instead. I found this meatloaf dense, a little dry, and salty (I added 3/4 tsp). It was nice to make it in the slow cooker and have it ready after a long busy day. this recipe has inspired me to try to make one of my other turkey meatloaf recipes in the slow cooker. Son, daughter and I all loved using Portobello mushrooms as buns. You definitely need to cut this up into small pieces to eat but so worth it. Son in law and hubby ate their burgers on a regular bun. Since I was cooking so many burgers I broiled our burgers on a broiling pan in the oven. Very tasty. My chops were larger, so after searing I let them finish in the oven then rest while I made the sauce. Made as written except I only made 2 chops but the full recipe of veg and sauce. Good Picture is without the grilled pita croutons and feta cheese since I prepared the salad for my work lunch and didn't want to add those items until ready to eat. I made enough for just one and no one else would eat it. I had all ingredients on hand and it made for a quick and tasty lunch. I thought this was pretty good for a very quick easy weeknight supper. M thought it was a bit bland and would have been better with marinara. Used banza chickpea pasta. ...if you have trouble getting dinner on the table, this is the book for you. Gina’s cookbook is filled with delicious and healthy quick and easy recipes AND slow cooker recipes. The easiest, tastiest, most convenient healthy recipes—ever! Each recipe includes nutritional information, which can help you take steps toward weight and health goals, and many dishes are vegetarian, gluten-free, and freezer-friendly—all called out with helpful icons. Gina’s practical advice for eating well and 120 color photos round out this indispensable cookbook.